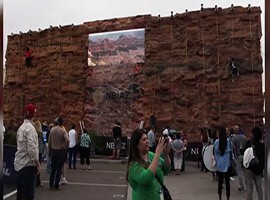 In the days leading up to the Super Bowl earlier this year, fans climbed the Grand Canyon Experience, a 30-foot wall painted in a tan sandstone color, bringing the signature landmark of Arizona to life. That wall is now headed for Margaret T. Hance Park as part of a $118 million renovation project. New England won the Super Bowl, fans returned home and the structure went into storage as the city tried to figure out what to do with it. On March 25, the Phoenix City Council voted to approve phase two of the Margaret T. Hance Park redesign. More than 2,000 attended a March 26 rally at Hance Park to support the plans. “We are always interested in citizen feedback, and it’s also something that gets everybody excited about the project,” Bach said. Hance Park, which opened in 1992, is named after the first female mayor of Phoenix. The 32-acre park stretches from 3rd Avenue to 3rd Street in downtown Phoenix. It currently features a dog park, the Irish Cultural Center and the Japanese Friendship Garden. The Phoenix Parks and Recreation Department started the design plan in late 2012. The city then contracted Weddle Gilmore Architects and Melk to come up with the plans for the redesign in 2013. City Councilman Jim Waring, concerned about the price tag, was the only member of the City Council who did not vote in favor of the Hance Park redesign. “It’s nothing against the park, it’s nothing against the project. It just makes me nervous. We are spending all this money on a park and in the mean time we are taking police and firefighters off the street,” said Waring. The city plans to raise the funds for the park improvements through a combination of private and public dollars. The city hopes most of the money will come from private donations, grants and corporate allies. The city will also support future bond funding. The project is not expected to affect taxpayers directly, but part of the model calls for the Phoenix Parks and Recreation Department to maintain the park with public funding. The estimated annual cost is more than $3 million, which includes personnel, general maintenance and security, especially for the wall. The schematic phase the City Council approved is expected to take five to seven months. This design will provide specific details on how the first phase will be put together. That includes developing the signature cloud that will hover over Central Avenue, marking the location of the park and providing additional shade for visitors. Also included in phase one are entrances from Central Avenue and the conversion of the existing firehouse structure into a restaurant with a beer garden, as well as beginning development of the Grand Canyon Experience at its new home. Weddle said the goal is to finish the first phase in about three years. Finishing the entire project will likely take up to 10 years. While installed at Super Bowl Central, the Grand Canyon Experience included a 20-foot waterfall and an 18-foot video screen. Those elements, however, will not be included when the wall makes the move to the park. The proposed plan will divide the park into different zones: the Central Plaza, the plateau to the east and the valley to the west. The park plans also include the addition of a concert pavilion, skate park, zip-line, coffee bar and splash pads. With Super Bowl XLIX having left town, many of its iconic show pieces have found new homes across the Valley of the Sun. The signature clouds will mark the entrance to the renovated Hance Park project. 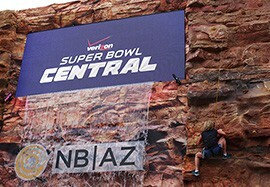 The Grand Canyon Experience at Super Bowl Central was the “wow” factor of Super Bowl week. The plan for the Hance Park redesign will divide the park by the valley, the plateau and the plaza, home to the wall.